Some years, the key emphasis of Lent is upon the work and life of Christ. We arrive at Easter glad to hear the news that he lives, and was not defeated in death. Now, we should arrive at Pentecost amazed by the news that the Holy Spirit allows Christ to work in our community through the Holy Spirit. This year, Pentecost falls on Aldersgate. 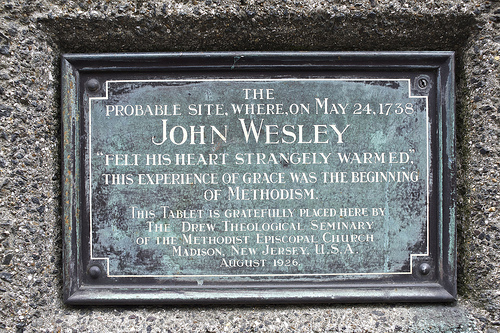 Those in the United Methodist tradition should be preparing to evaluate how their church lives out of the same spirit that warmed the heart of John Wesley. Like the early church in Acts, Pentecost pushes us into the streets to show our commitment to social justice. It was the heart of a missionary that was prepared for the spirit on May 24th. John Wesley was also a man prepared for his Pentecost by a life of personal piety and daily devotions. Such things matter.